The Eldred, PA area has had 0 reports of on-the-ground hail by trained spotters, and has been under severe weather warnings 10 times during the past 12 months. 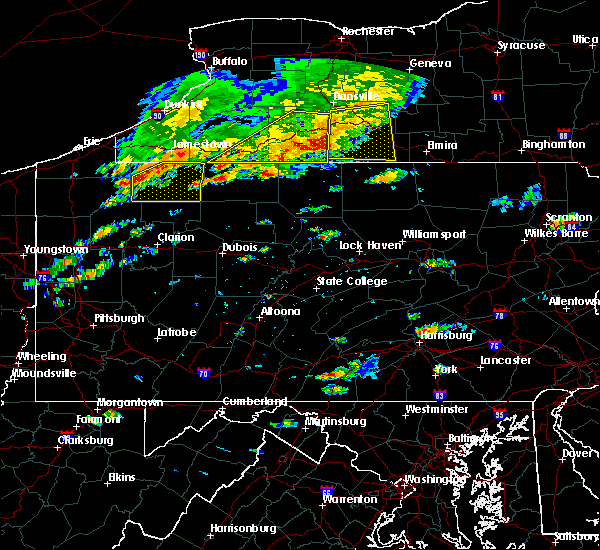 Doppler radar has detected hail at or near Eldred, PA on 13 occasions, including 1 occasion during the past year. 4/14/2019 9:36 PM EDT At 935 pm edt, severe thunderstorms were located along a line extending from near cuba to near brandy camp, moving northeast at 50 mph (radar indicated). Hazards include 60 mph wind gusts and penny size hail. Expect damage to roofs, siding, and trees. locations impacted include, bradford, ridgway, johnsonburg, smethport, wilcox, rew, coryville, cyclone, brandy camp, east branch dam, kinzua bridge state park, brockport, portland mills, mount jewett, eldred, lewis run and bradford airport. 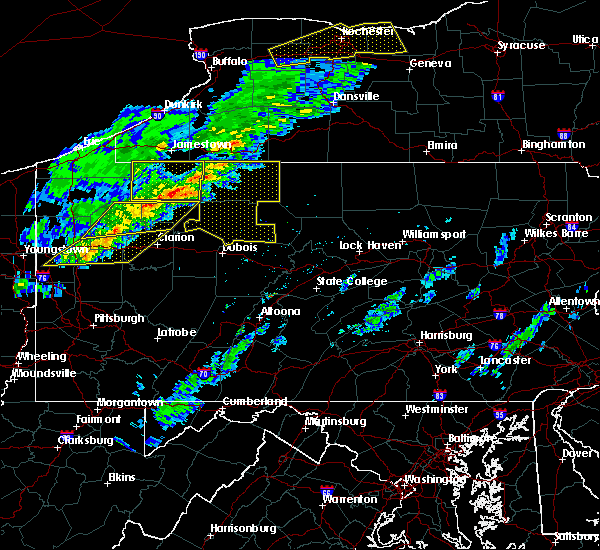 A tornado watch remains in effect until 300 am edt for north central pennsylvania. 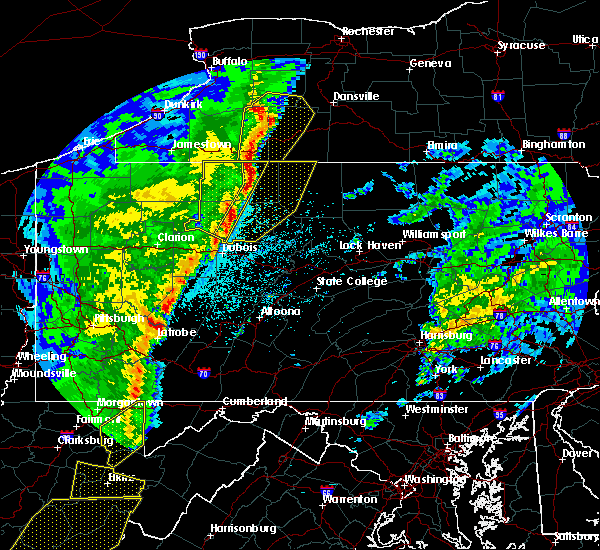 4/14/2019 9:11 PM EDT At 909 pm edt, severe thunderstorms were located along a line extending from near allegany to near brookville, moving northeast at 50 mph (radar indicated). Hazards include 60 mph wind gusts and penny size hail. Expect damage to roofs, siding, and trees. locations impacted include, bradford, ridgway, kane, johnsonburg, smethport, wetmore, wilcox, james city, rew, coryville, cyclone, brandy camp, ludlow, marshburg, east branch dam, westline, kinzua bridge state park, brockport, portland mills and mount jewett. 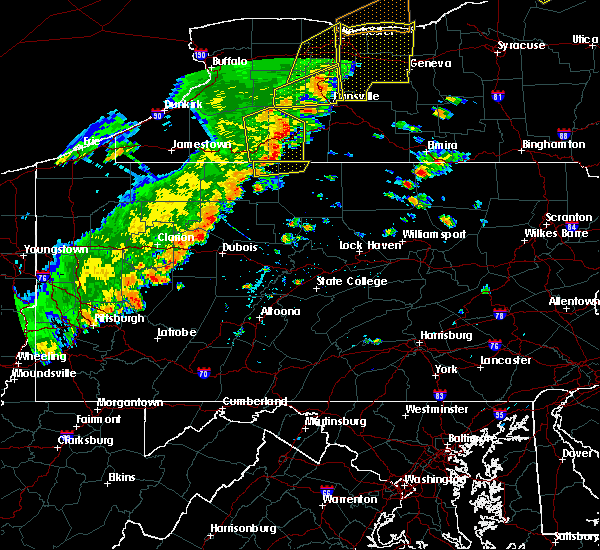 A tornado watch remains in effect until 300 am edt for north central pennsylvania. 9/21/2018 7:37 PM EDT The national weather service in state college pa has issued a * severe thunderstorm warning for. northern elk county in north central pennsylvania. mckean county in north central pennsylvania. potter county in north central pennsylvania. Northern cameron county in north central pennsylvania. 9/21/2018 6:30 PM EDT The national weather service in state college pa has issued a * severe thunderstorm warning for. elk county in north central pennsylvania. warren county in north central pennsylvania. north central clearfield county in central pennsylvania. Mckean county in north central pennsylvania. 5/4/2018 5:23 PM EDT At 429 pm edt, severe thunderstorms were located along a line extending from 7 miles southwest of allegany state park to near wetmore to 7 miles southeast of tionesta, moving east at 60 mph (radar indicated). Hazards include 70 mph wind gusts. Expect considerable tree damage. Damage is likely to mobile homes, roofs, and outbuildings. 5/4/2018 4:31 PM EDT At 429 pm edt, severe thunderstorms were located along a line extending from 7 miles southwest of allegany state park to near wetmore to 7 miles southeast of tionesta, moving east at 60 mph (radar indicated). Hazards include 70 mph wind gusts. Expect considerable tree damage. Damage is likely to mobile homes, roofs, and outbuildings. 11/5/2017 9:06 PM EST At 904 pm est, severe thunderstorms were located along a line extending from 6 miles northeast of weston mills to near port allegany to near east branch dam, moving east at 30 mph. these storms are weakening as they move to the east. 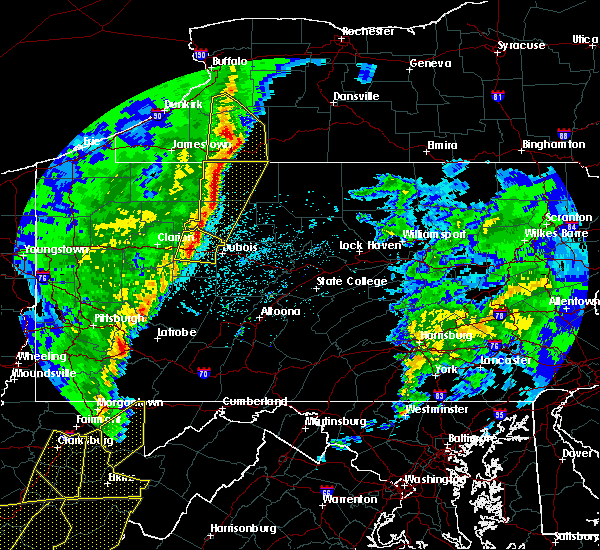 however, they may still produce wind damage through 915 pm est (radar indicated). Hazards include 60 mph wind gusts. Expect damage to trees and power lines. locations impacted include, ridgway, st. Marys, johnsonburg, coryville, crosby, smethport, brandy camp, east branch dam, brockport and kinzua bridge state park. 11/5/2017 8:37 PM EST At 834 pm est, severe thunderstorms were located along a line extending from 6 miles north of bradford to near westline to 6 miles northwest of portland mills, moving east at 60 mph. there is an area of rotation indicated by radar just south of james city near route 948. while not immediately likely, storms which have rotation can produce a tornado (radar indicated). Hazards include 60 mph wind gusts. Expect damage to trees and power lines. locations impacted include, bradford, ridgway, kane, st. Marys, johnsonburg, allegany state park, crosby, rew, ludlow and marshburg. 10/15/2017 5:49 PM EDT At 544 pm edt, severe thunderstorms were located along a line extending from 6 miles south of weston mills to near cyclone to near westline to near james city, moving east at 55 mph (radar indicated). Hazards include 70 mph wind gusts. Expect considerable tree damage. damage is likely to mobile homes, roofs, and outbuildings. these severe storms will be near, smethport and coryville around 550 pm edt. 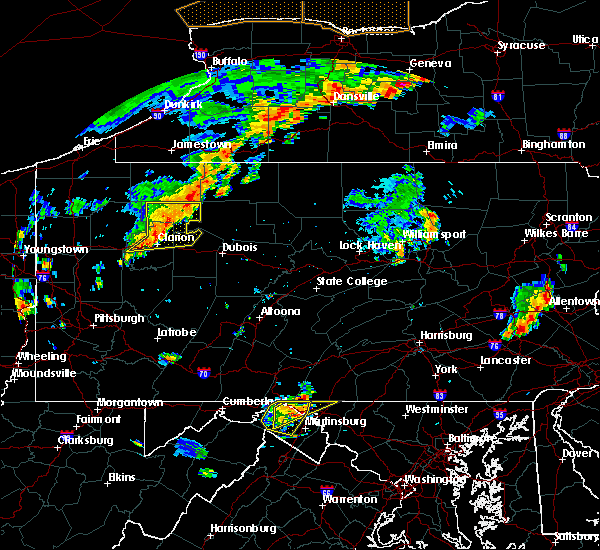 crosby, betula and port allegany around 600 pm edt. Other locations impacted by these severe thunderstorms include eldred, mount jewett, bradford airport and lewis run. 10/15/2017 5:24 PM EDT At 520 pm edt, severe thunderstorms were located along a line extending from near allegany state park to near kinzua dam to near sheffield to 11 miles northeast of tionesta, moving east at 50 mph (radar indicated). Hazards include 70 mph wind gusts. Expect considerable tree damage. damage is likely to mobile homes, roofs, and outbuildings. 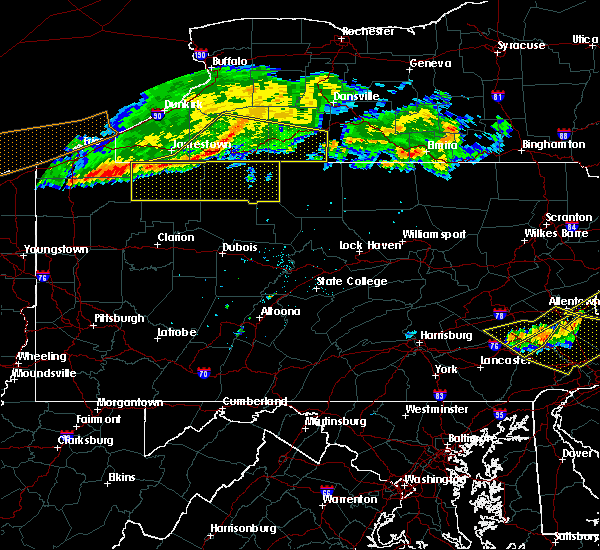 these severe storms will be near, bradford and marshburg around 530 pm edt. cyclone and westline around 540 pm edt. 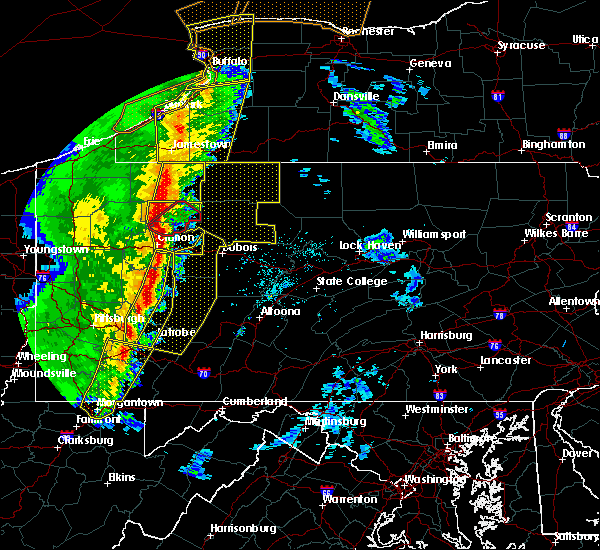 kane, coryville, kinzua bridge state park, smethport and rew around 550 pm edt. 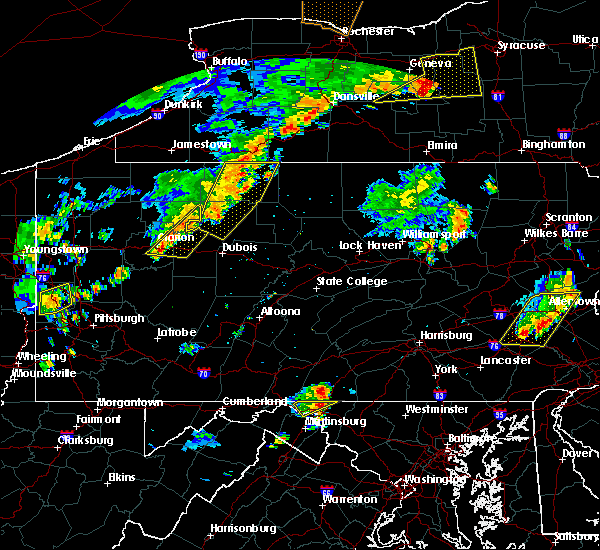 crosby, port allegany, shinglehouse and betula around 600 pm edt. Other locations impacted by these severe thunderstorms include eldred, lewis run, mount jewett, clarendon, university of pittsburgh - bradford and bradford airport. 10/15/2017 4:46 PM EDT At 446 pm edt, severe thunderstorms were located along a line extending from near frewsburg to garland to 8 miles northwest of oil city, moving east at 40 mph (radar indicated). Hazards include 60 mph wind gusts. Expect damage to trees and power lines. 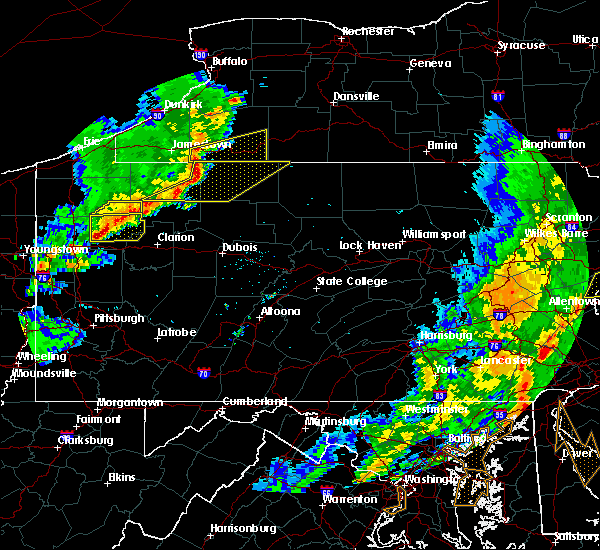 severe thunderstorms will be near, garland and lottsville around 450 pm edt. youngsville around 500 pm edt. warren, warren south, chapman state park and russell around 510 pm edt. 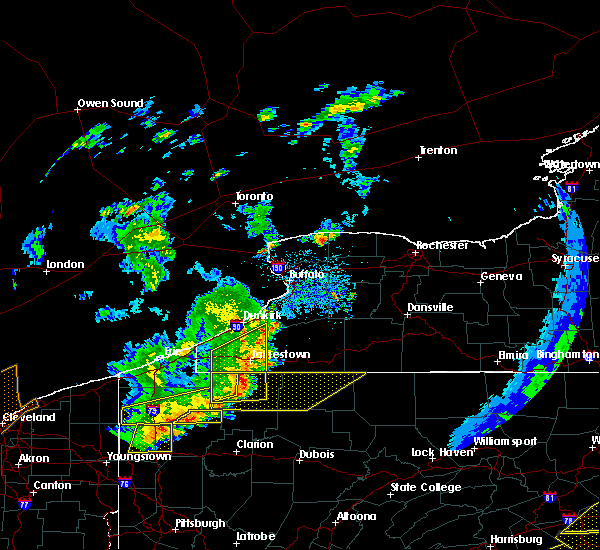 kinzua dam, scandia and sheffield around 520 pm edt. Other locations impacted by these severe thunderstorms include tidioute, ceres, starbrick, sugar grove, eldred, lewis run, mount jewett, clarendon, bradford airport and university of pittsburgh - bradford. 9/4/2017 11:56 PM EDT At 1154 pm edt, a severe thunderstorm was located near allegany state park, moving east at 45 mph (radar indicated). Hazards include 70 mph wind gusts. Expect considerable tree damage. Damage is likely to mobile homes, roofs, and outbuildings. 6/18/2017 5:23 PM EDT At 521 pm edt, a severe thunderstorm was located between eldred and shinglehouse, moving east at 30 mph. minor rotation was indicated on radar and while not likely, a brief, weak tornado may be possible (radar indicated). Hazards include 60 mph wind gusts and penny size hail. Expect damage to trees and power lines. This severe thunderstorm will remain over otherwise rural areas of northeastern mckean and northwestern potter counties, including the following locations: ceres, and oswayo. 6/18/2017 4:57 PM EDT At 456 pm edt, severe thunderstorms were located along a line extending from 6 miles southwest of st. bonaventure to near rew to near cyclone, moving east at 45 mph (law enforcement). Hazards include 60 mph wind gusts. Expect damage to trees and power lines. 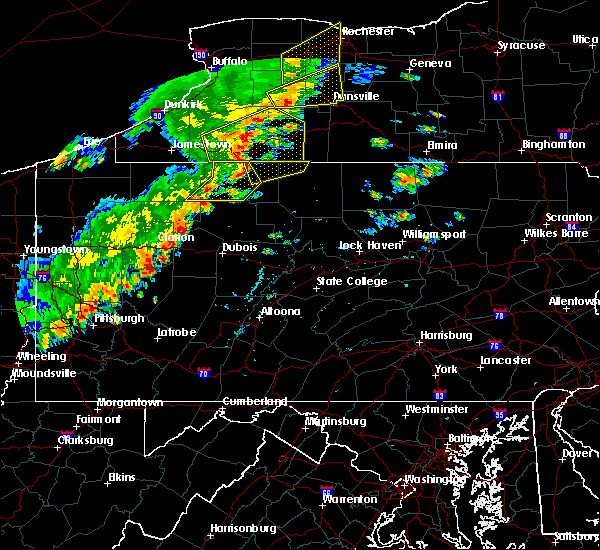 severe thunderstorms will be near, coryville and smethport around 510 pm edt. shinglehouse around 520 pm edt. Other locations impacted by these severe thunderstorms include ceres, oswayo and eldred. 8/13/2016 8:11 PM EDT At 810 pm edt, severe thunderstorms with gusty winds were located along a line extending from shinglehouse to near betula to near portland mills, moving east at 50 mph (radar indicated). Hazards include 60 mph wind gusts. Expect damage to roofs. siding. And trees. 8/13/2016 7:50 PM EDT At 749 pm edt, severe thunderstorms were located along a line extending from near marshburg to james city to near clarion, moving east at 40 mph (radar indicated). Hazards include 60 mph wind gusts. Expect damage to roofs. siding. and trees. locations impacted include, johnsonburg, kane, bradford, ridgway, st. Marys, portland mills, smethport, east branch dam, crosby, betula, marshburg, cyclone, brandy camp, kinzua bridge state park, wilcox, coryville, rew, james city, westline and lewis run. 8/13/2016 7:30 PM EDT At 729 pm edt, severe thunderstorms were located along a line extending from near ludlow to near marienville to near clarion, moving east at 40 mph (radar indicated). Hazards include 60 mph wind gusts. Expect damage to roofs. siding. And trees. 7/25/2016 1:38 PM EDT At 137 pm edt, a severe thunderstorm was located near port allegany, moving east at 40 mph (radar indicated). Hazards include 60 mph wind gusts and quarter size hail. Hail damage to vehicles is expected. Expect wind damage to roofs, siding, and trees. 6/5/2016 5:56 PM EDT At 555 pm edt, severe thunderstorms were located along a line extending from weston mills to smethport to just north of wilcox, moving east at 45 mph (radar indicated). Hazards include 60 to 70 mph wind gusts. Expect considerable tree damage. damage is likely to mobile homes, roofs, and outbuildings. 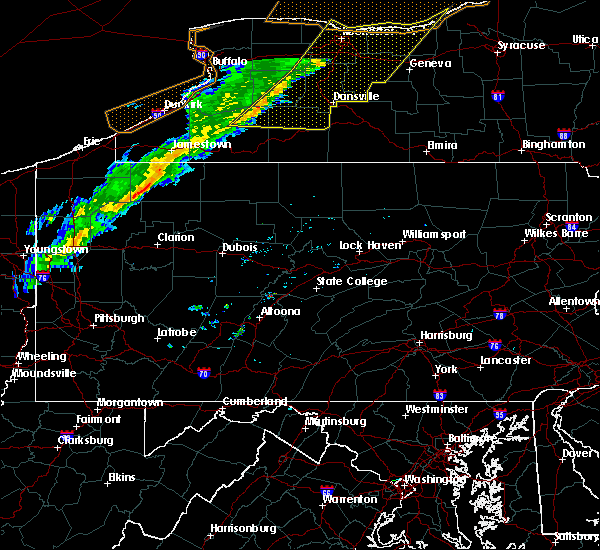 severe thunderstorms will be near, port allegany and shinglehouse around 600 pm edt. roulette and betula around 610 pm edt. 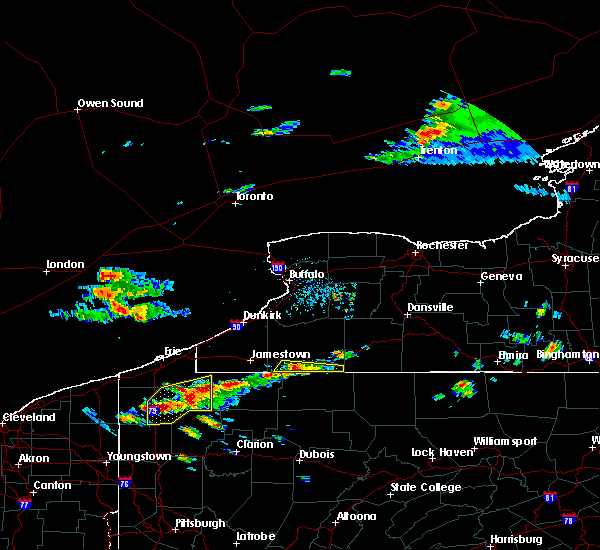 coudersport around 620 pm edt. genesee, sizerville, denton hill state park and keating summit around 630 pm edt. Other locations impacted by these severe thunderstorms include oswayo, ulysses, eldred, ceres, austin, mount jewett, sweden valley, bradford airport and ski denton ski area. 6/5/2016 5:36 PM EDT At 533 pm edt, severe thunderstorms were located along a line extending from bradford to marshburg to sheffield, moving east at 55 mph (law enforcement). Hazards include 70 mph wind gusts. Expect considerable tree damage. damage is likely to mobile homes, roofs, and outbuildings. these severe storms will be near, bradford, rew and cyclone around 540 pm edt. kane, wetmore, james city and coryville around 550 pm edt. shinglehouse, westline and kinzua bridge state park around 600 pm edt. Other locations impacted by these severe thunderstorms include lewis run, eldred, mount jewett, university of pittsburgh - bradford and bradford airport. 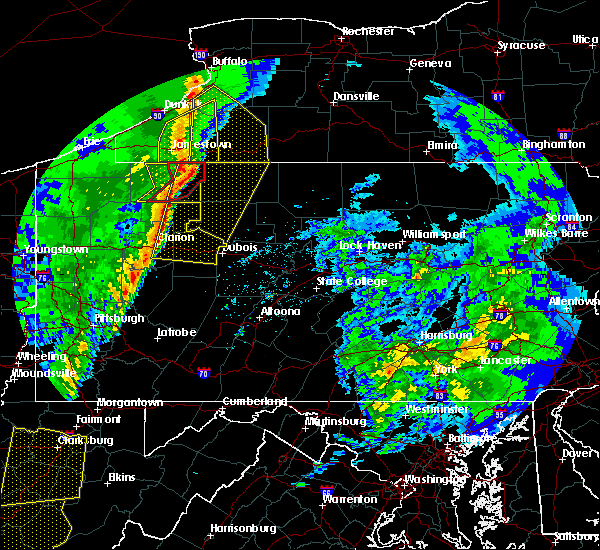 6/5/2016 5:18 PM EDT At 517 pm edt, severe thunderstorms were located along a line extending from allegany state park to kinzua dam to tionesta, moving east at 55 mph (trained weather spotters). Hazards include 70 mph wind gusts. Expect considerable tree damage. damage is likely to mobile homes, roofs, and outbuildings. 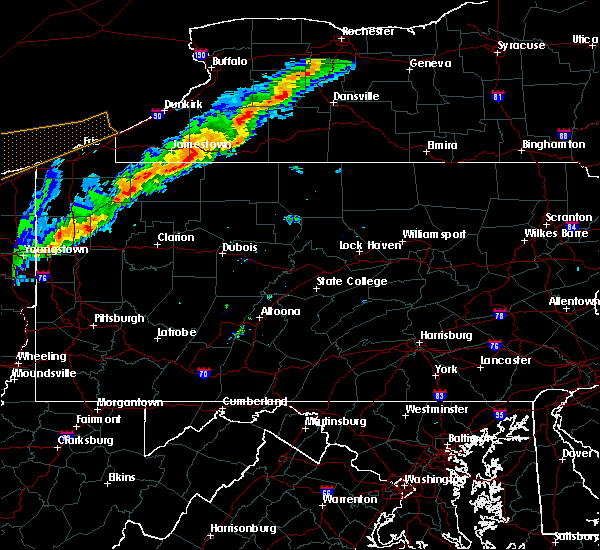 these severe storms will be near, kinzua dam around 520 pm edt. 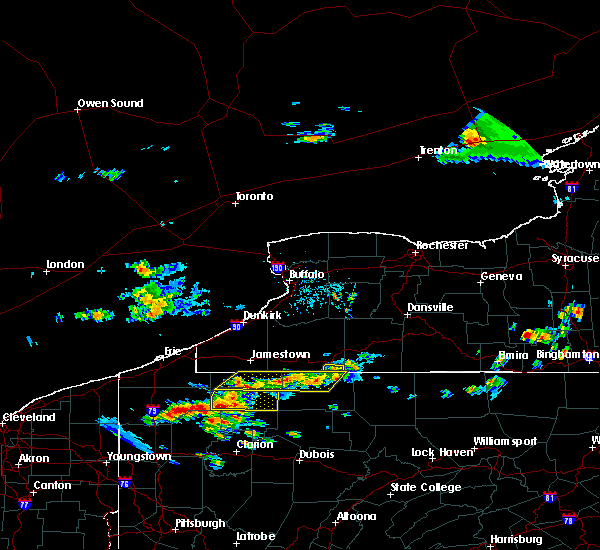 allegany state park and marshburg around 530 pm edt. bradford, rew, sheffield, ludlow and cyclone around 540 pm edt. kane, wetmore, james city and coryville around 550 pm edt. Other locations impacted by these severe thunderstorms include lewis run, eldred, ceres, clarendon, mount jewett, tidioute, bradford airport and university of pittsburgh - bradford. 6/5/2016 4:54 PM EDT At 453 pm edt, severe thunderstorms were located along a line extending from near jamestown to youngsville to oil city, moving east at 55 mph (radar indicated). Hazards include 60 to 70 mph wind gusts. Expect considerable tree damage. Damage is likely to mobile homes, roofs, and outbuildings. 7/19/2015 6:44 PM EDT At 642 pm edt, doppler radar indicated a severe thunderstorm capable of producing quarter size hail and damaging winds in excess of 60 mph. this storm was located near cuba, moving southeast at 25 mph. other storms were forming behind this storm, as far west to near warren. locations impacted include, allegany state park, bradford, warren, coryville, cyclone, garland, kinzua dam, lottsville, marshburg, rew, russell, scandia, smethport, warren south, youngsville, eldred, lewis run, starbrick, sugar grove and bradford airport. 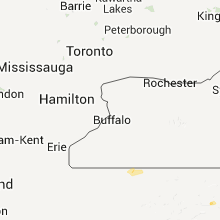 7/19/2015 6:15 PM EDT At 613 pm edt, doppler radar indicated a severe thunderstorm capable of producing quarter size hail and damaging winds around 60 mph. this storm was located near allegany state park, and moving southeast at 25 mph. other strong were forming behind this storm. 7/7/2015 5:41 PM EDT At 541 pm edt, doppler radar indicated a severe thunderstorm capable of producing damaging winds around 60 mph. this storm was located near rew, and moving northeast at 45 mph. 6/23/2015 6:13 AM EDT At 611 am edt, doppler radar indicated a line of severe thunderstorms capable of producing destructive winds in excess of 70 mph. these storms were located along a line extending from near weston mills to near smethport to near james city, moving east at 60 mph. 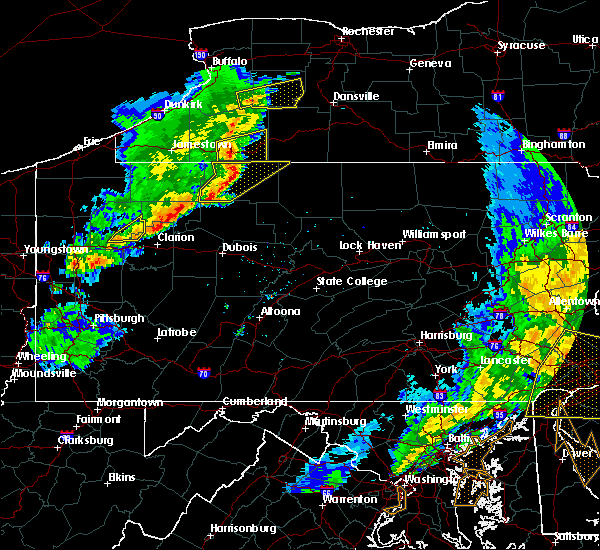 these severe storms will be near, port allegany, roulette and shinglehouse around 620 am edt. 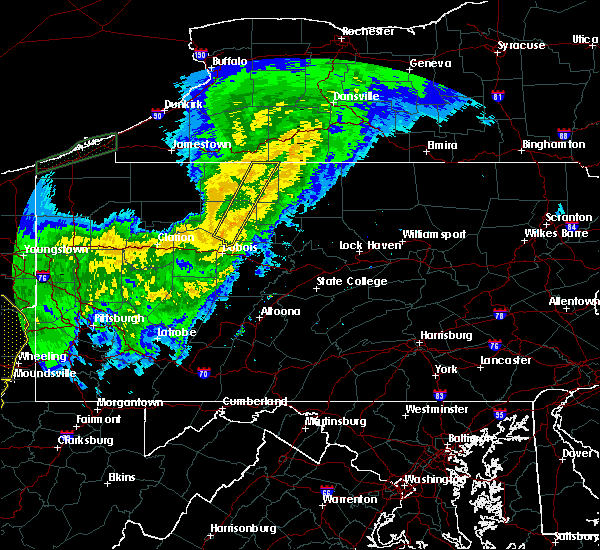 coudersport around 630 am edt. denton hill state park, elk river, emporium, genesee, lyman run state park, sizerville and truman around 640 am edt. other locations impacted by these severe thunderstorms include austin, eldred, lewis run, mount jewett, oswayo, sweden valley, ulysses, bradford airport, ski denton ski area and university of pittsburgh - bradford. 6/23/2015 5:50 AM EDT At 549 am edt, doppler radar indicated a line of severe thunderstorms capable of producing damaging winds of 60 to 70 mph. these storms were located along a line extending from near allegany park to near marshburg to near kellettville, and moving east at 60 mph. 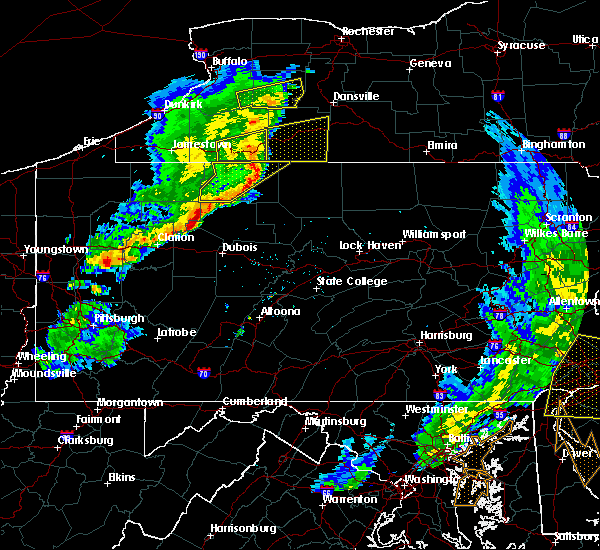 * severe thunderstorms will be near, marshburg and westline around 550 am edt. 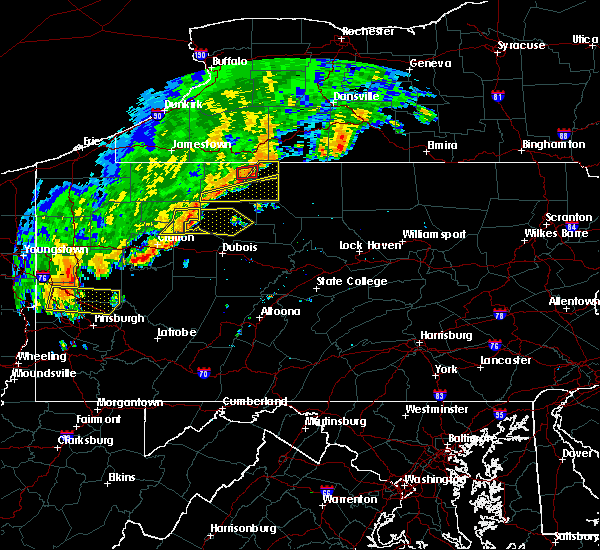 bradford, cyclone, kinzua bridge state park and rew around 600 am edt. 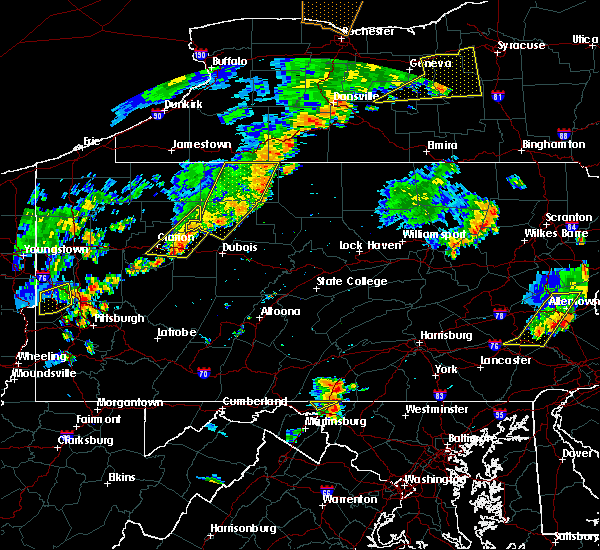 kane, coryville, crosby, james city and smethport around 610 am edt. 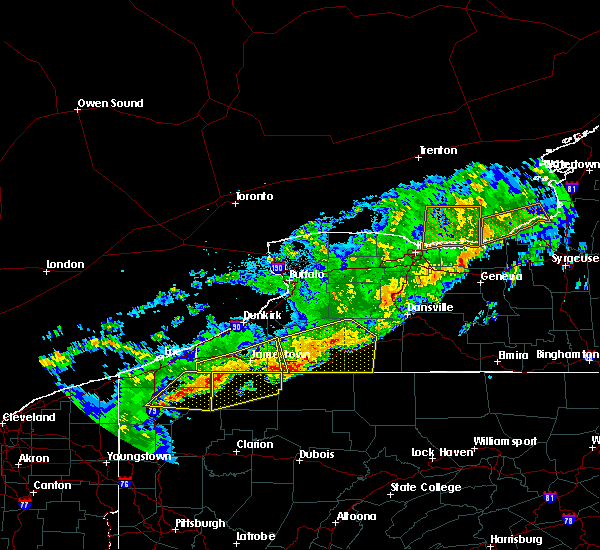 johnsonburg, east branch dam, port allegany, roulette, shinglehouse and wilcox around 620 am edt. other locations impacted by these severe thunderstorms include austin, clarendon, eldred, lewis run, mount jewett, oswayo, starbrick, sugar grove, sweden valley and tidioute.